Experiencing the back pain, groin pain, fever, chills, nausea or vomiting associated with kidney stones may spur you to change your lifestyle to avoid further stone formation. A kidney stone is solid mass of crystals that can collect in your kidney or anywhere else in your urinary tract. Certain foods and beverages may increase your risk for kidney stone formation, but coffee and caffeine may have protective effects. Researchers at the Harvard School of Public Health, Department of Nutrition, developed a study to assess the effects of certain beverages on kidney stone formation. In this study, which appeared in the October 1996 issue of the "American Journal of Epidemiology," the researchers determined the relationship between 21 different types of beverages and the risk for kidney stone formation in more than 45,000 men. They found that caffeinated coffee reduced the risk of kidney stone formation by 10 percent. In the same study, the research team determined the effect of decaffeinated coffee on kidney stone risk. The researchers found that decaffeinated coffee also resulted in a 10 percent reduction in kidney stone formation. They could not determine if caffeine alone reduces the risk of kidney stone formation, or if substances in coffee reduce the risk of kidney stone formation. Although caffeine and coffee are not correlated with kidney stone formation, dehydration is a known cause of kidney stone formation. Because caffeine and coffee have diuretic effects, causing frequent urination, you should be cautious of your hydration status. If you drink coffee or caffeinated beverages, make sure you drink plenty of water to maintain adequate hydration to prevent kidney stone formation. Drinking up to three 8-oz. 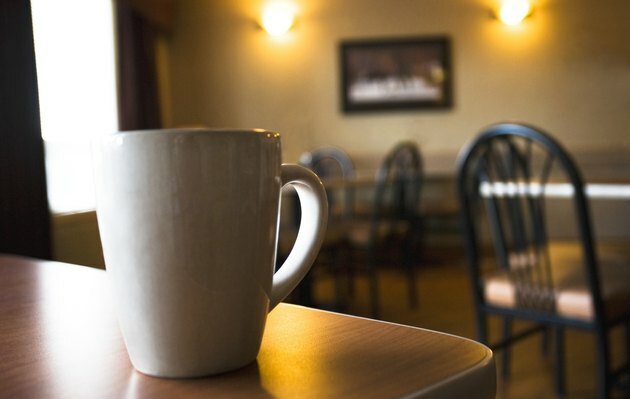 cups of coffee, the equivalent of 250 mg of caffeine, is safe for most people. However, you should reduce your intake if the effects of coffee and caffeine make you anxious or irritable, cause difficulty sleeping or increase your heart rate. You should not drink more than 10 cups per days, states Medline Plus. Work with your doctor to develop a plan to reduce your risk for kidney stone formation.